Thanks to the generosity of a friend I was delighted to taste two remarkable wines recently: Domaine de la Romanée-Conti, Richebourg 1969 and Château Margaux 1961, the former made in the year that Neil Armstrong stepped on the moon and the latter when John F Kennedy took office in the White House. Both were excellent. Apologies for the quality of the photos – taken in poor light on what is now a stone-age iPhone. 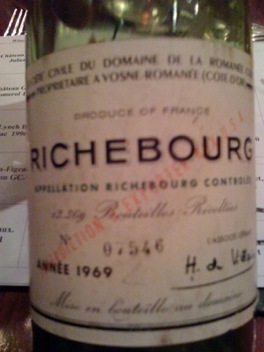 The Richebourg was pale red and exotically scented with a splendid lively tingle on the palate. Very delicate but intense and with fabulous length. 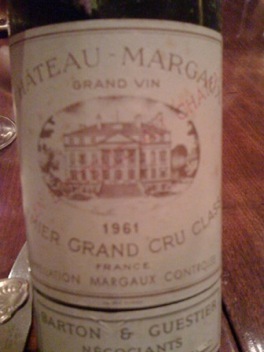 The Margaux still boasted a vibrant, transparent crimson and a fragrant nose. It had less tingle than the Richebourg and was more gently textured. Gorgeous sweet fruit, soft and rounded, like a perfect pearl of flavour. What was remarkable about the wines was how many similarities they shared, proving yet again that as wines age their characteristics tend to converge and the normal markers that we use to distinguish, say, Cabernet from Pinot become blurred, a bit like people, I suppose. Both of the wines had been bought over 30 years ago and each came with a good tale attached. At that time my host was travelling regularly to the USA on business and whenever he passed through New York he would buy two bottles of Romanée-Conti wines for the cellar. Curiously, a close examination of the Richebourg label revealed the words, printed diagonally in red: “Interdiction d’exporter aux USA.” Proving there was probably a ‘grey’ market in these rare treasures even then. The Margaux was cannily snapped up, along with other gems, when the cellar of the Gresham Hotel, Dublin was sold off in the 1970s.